Posted under Health Guides. Updated 2 May 2014. The best way to protect yourself from bug bites and stings is to avoid places where bugs are likely to be or wear long sleeves and long plants and insect repellant. Wear light colored clothing: long sleeve shirts, long pants, socks and shoes. Try not to wear bright or flower print clothing when you’re outside near stinging bugs. They may think you’re a flower! Use an insect repellant that contains DEET. It may be listed on the product label as N, N-diethyl-m-toluamide. Don’t apply insect repellant directly to your face. Spray a small amount on your hands then gently rub it on your face and neck. Be careful not to touch your eyes and mouth. Don’t use combination sunscreen and DEET products because sunscreen should be reapplied but DEET should not. Avoid wearing cologne or scented lotion when outside. Be careful when eating sweets or drinking out of soda cans while outside (bees and wasps often fly into soda cans then sting a person when they take a sip). Avoid areas with puddles of still water as mosquitoes lay their eggs there. Don’t harm a bee or wasp nest. Did you know that mosquitoes are more active as the sun goes down and again during sunrise? You can lower your risk of getting bitten by planning outdoor activities in the afternoon. Stings are usually painful at first but feel better quickly. Bees often leave behind a stinger. Try to take it out of your skin as quickly as possible. You can use a clean pair of tweezers to pinch the stinger or you can use the side of a plastic credit card to flick it off of your body. Wasps don’t leave stingers. Wash your sting with soap and water and pat dry. Put an ice pack or a cold, wet washcloth on the sting for 15-20 minutes. Apply a small amount of antibiotic ointment to keep the sting from getting infected. Don’t scratch the sting or bug bite as this may cause infection. Most of the time bee/wasp stings are not serious unless a person has an allergic reaction or if the bite becomes infected. Symptoms of an allergic reaction include a rash or “hives”; swelling of the lips; tongue or face; dizziness or fainting; trouble breathing. If any of these symptoms occur, it’s important to get help right away! Mosquito bites: Bites from mosquitoes are itchy rather than painful. They look like a very small puffy white bump that usually shows up soon after the mosquito bites the skin and feeds on blood. The puffiness is swelling that is caused from inflammation. Most of the time mosquito bites heal on their own without any medical treatment. To prevent infection, wash the bite with soap and water and pat dry. Use an over-the-counter hydrocortisone cream or calamine lotion to the bite(s) if it is very itchy. West Nile Virus (WN): West Nile virus is an illness that mostly affects birds. Humans and other animals can become infected if they are bitten by an infected mosquito. Mosquitoes become infected by biting a bird that has the West Nile virus. According to the Center for Disease Control (CDC) the West Nile virus has been reported in 47 states and the District of Columbia.Outbreaks of the WN virus most often occur during the summer and fall in the United States. However, most people who become infected with the WN virus don’t get sick (only about 1 in 4). Symptoms are like the flu and usually go away without treatment but can be serious. Eastern Equine Encephalitis (EEE): Eastern Equine Encephalitis virus (EEEV) is a rare but serious illness transmitted by an infected mosquito. It affects the brain in humans and can lead to permanent damage. Horses can also acquire EEE the same way humans get it. According to the Center for Disease Control only 5-10 cases are reported in the United States each year. People who live in areas where EEE has been reported (Florida, Georgia, Massachusetts, and New Jersey), and who spend a lot of time outdoors in these areas are at the greatest risk. Adults over 50 years of age as well as teens and children under the age of 15, are at greatest risk of severe disease (and complications) after being infected with the EEE virus. Symptoms include fever, headache, restlessness, sleepiness, no appetite, vomiting, diarrhea, and in very bad cases, convulsions and coma. Malaria: Malaria is a very serious illness and major cause of death in certain areas of the world. Although it’s not found in the United States, you’re at risk if you live or travel to certain countries, especially in sub-Saharan Africa and South Asia. Mosquitoes become infected with one of four different types of parasites then spread it to humans when they bite. Symptoms include; chills, fever, vomiting, diarrhea and yellowing of the skin and eyes. If you are traveling to areas that are known to have malaria outbreaks, tell your health care provider. You can take medicine that will lessen your chance of getting malaria while you travel. No matter what, avoid mosquitoes; wear long sleeves/pants; and wear DEET insect repellant. 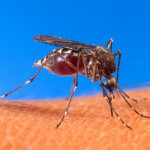 Yellow fever: Yellow fever is a very serious illness caused by the bite of an infected mosquito. You’re at risk if you live or travel to regions such as South Africa. Not every mosquito carries yellow fever. If you are bitten by an infected one, symptoms usually start 3-6 days later. Early symptoms include: headache, muscle and joint aches, fever, flushing and loss of appetite. Most of the time people get better within about 3-4 days. Those who don’t may have severe symptoms such as: an irregular heartbeat, bleeding and eventually, coma. Talk to your health care provider well in advance before traveling to countries and regions where malaria and yellow fever occur so you can get vaccinated. You can also lower your risk of becoming infected by wearing protective clothing, using mosquito repellant with DEET, and sleeping in a screened in area. Spider Bites: Most spiders found in the United States are harmless, but the brown recluse spider and black widow spider are called “venomous” because their bite is poisonous. If you were bitten by a spider, you might not even know, but you would likely notice swelling of the area and skin changes. A scab usually forms in a week or so. Try not to pick or scratch at the scab to prevent infection. If you think you were bitten by a venomous spider, call your health care provider as soon as possible and follow the tips below. Wash the area with soap and water 2-3 times a day until it feels better. Put an ice pack or a cold, wet washcloth on the bite for 15-20 minutes. Tick Bites: Tick bites are most common if you’ve been around a wooded area. If you or someone you know gets bitten by a tick (and it’s still attached to your skin), use the tips listed below to lessen the chance of infection. Use tweezers to grab the tick at its head or mouth. Pull on the tick until it lets go. Do NOT twist it. Apply antibiotic ointment to the area. NEVER use petroleum jelly or a lit match to remove tick(s). Save the tick and bring it to your appointment. (You can put the tick in small plastic bag or jar). Lyme disease: Lyme disease is an infection that is caused from an infected deer tick. The deer tick is very small – about the size of a small freckle. Lyme disease occurs mostly in the Northeast, upper Midwest and Pacific coast areas in the United States. Only infected deer ticks that attach to the skin can cause Lyme disease and the longer the tick stays attached, the more likely it will infect the person. If you develop Lyme disease you might see a red bump that spreads into a rash that often looks like a “bulls eye” (pink in the center and darker red on the outside). Symptoms of Lyme disease are similar to the flu. Early symptoms may also include chills, fever, headache, body aches and tiredness. Later symptoms can include swollen joints and general weakness. Bottom-line; if you think you have been bitten by a tick, call your health care provider. If you have any of the symptoms listed below, go to the closest emergency room!